An interesting project to celebrate Peter Barr is taking place in Tooting. Anyone interested in getting involved with this project should contact Geoff Simmonds. My name is Geoff Simmons and I organise a ‘community history’ project in Tooting, south London called Summerstown182. It started out as a First World War centenary research exercise but has developed into interest in wider local social history. One of our objectives is increasing knowledge and awareness of that by putting up a series of plaques. The ‘unveilings’ of these are very public events, we raise funds through guided walks of the locality, publicise the occasion via talks and social media. We make a big effort to involve local schools, businesses, the council and community groups. Its all about making sure as many people as possible get to know something about the history of where they live and feel involved. 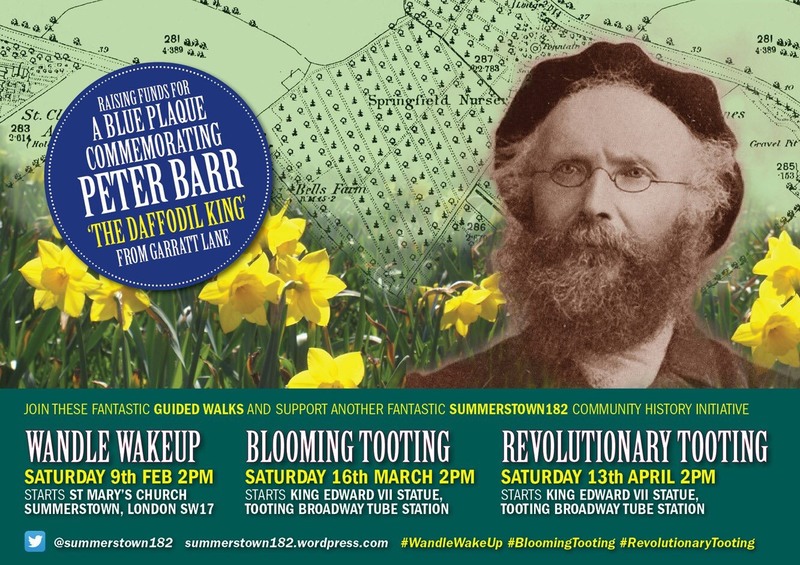 Later this year we intend to place a plaque on a house in Tooting where Peter Barr ‘The Daffodil King’ once lived. His story was brought to my attention by a local resident, George Deer who about 20 years ago undertook some detailed research about Peter Barr’s local connections and was in touch with The Daffodil Society. He is now very elderly, but excited about the plan and I hope we can involve him. The story of Peter Barr’s nursery in Tooting and those of the Rollisons before is not widely known locally but when I have spoken about it on my tours it has been very enthusiastically received. Who doesn’t love these beautiful flowers! A plaque for the man who popularised the daffodil will I believe be something everyone can relate to and all ages will benefit from acknowledging the daffodil’s association with our area. It is something that one local school carried through for many years in the last century, giving bulbs to children and awarding certificates to the best growers. A few years ago we had a lovely ceremony for a forgotten local WW1 soldier where children made daffodil tributes. That has got the ball rolling and now we want to start planning the plaque. One of the addresses where Peter Barr lived according to the 1871 census, still stands in its original state. Here he resided with his wife and seven young children before relocating to nearby ‘Bells Farm’ of which there is now no trace. What is very exciting (and of course allows this to happen) is that the owners of the house (who have themselves lived there a very long time) are extremely supportive. One runs a gardening club in a local school – which is actually on the site of the old ‘Springfield Nursery’ and another family member unbelievably has a Daffodil growing business in the Scilly Isles. They knew nothing about this until I did a project at the school last summer. The house is in a very prominent position close to bustling Tooting Broadway on one of the busiest roads in south London, Garratt Lane. The plaque will be seen by thousands of people passing every day. Tooting is a high-profile ‘happening’ area right now with a lot of great community activity. I think we have something here which will really capture people’s imagination and put Tooting’s connection with the evolution of the daffodil firmly on the map. Anyone who knows more about Peter Barr or his work in this area or can point me in the right direction to undertake more research would be most gratefully received. The more knowledge we have the better equipped we will be to pass on his story as accurately as we can. We will also be hoping to trace an ancestor of Peter Barr’s, someone who could even possibly ‘unveil’ the plaque! We haven’t gone into this aspect in any great detail so far but finding someone would certainly give the project a whole extra dimension. No date is fixed yet for this but I envisage a date in late September to coincide with a local festival. We intend to raise funding for the plaque through s series of historic walks .